Verdict: 2.75 / 5Overall, if you have the time give The Unexpected a try. However, if you are looking for a series that you can sink your teeth into, perhaps The Immortal Men will be a better fit. Much like the title, readers are probably not quite sure what to expect from this brand new title that promises to expand the DC Universe further after the much popular Dark Nights: Metal arc. Introducing its audience to a brand new cast of established and complex characters, The Unexpected does not disappoint in its bid to be just that. 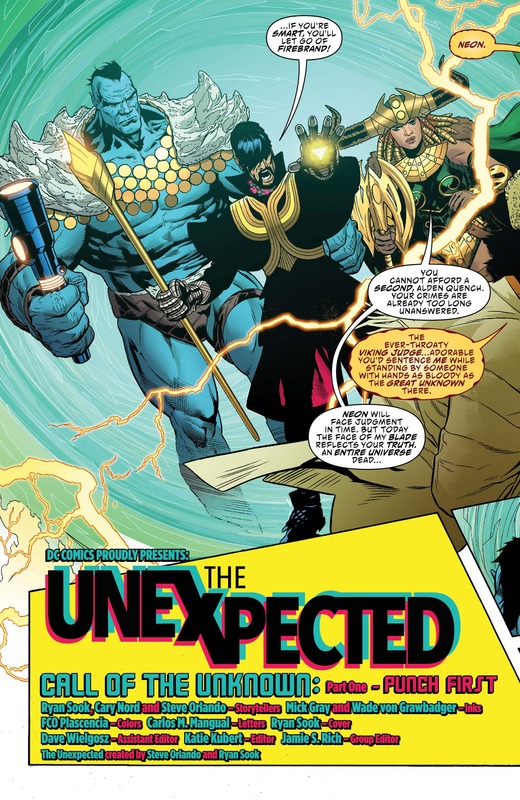 Becoming a launching pad for a new team, The Unexpected seems to serve the same sort of purpose as The Immortal Men. A carbon copy of sorts, we are introduced to Firebrand, although not a Firebrand we have previously seen in DC continuity. A rebrand of sorts, this new Firebrand is powered by the Conflict Engine, a powerful heart that must be fed with battle and war in order to keep on giving life to this new hero. Alongside Firebrand, who seems content in her life of battle and helping in a local hospital, we are also introduced to a three-piece team of the Judge, a Viking Warrior that seems to seek balance and justice, Ascendant, a magic blue beast, and Neon the Unknown, who seems to be an intergalactic criminal in his own right. Becoming a launching pad for a new team, The Unexpected seems to serve the same sort of purpose as The Immortal Men. 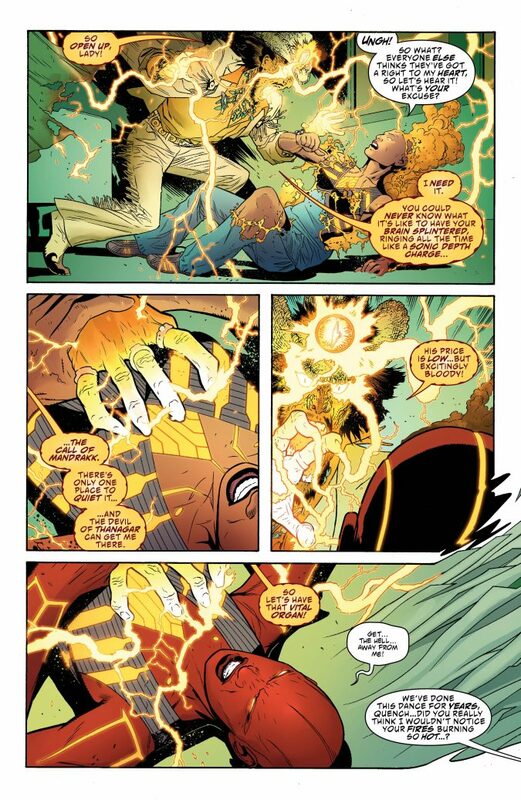 Don’t get too attached to this team, however, as the Bad Samaritan has come from destroying multiple Earth’s to find the Conflict Engine belonging to Firebrand. Giving her a huge target on her back, many are after this rare piece of technology, especially the dying Devil himself, who appears to be the villain of the piece. With Samaritan causing havoc already and somehow creating a new metal by killing off both Judge and Ascendant in quick fashion, as well as himself in the process, Neon and Firebrand are now left to pick up the pieces and work together in order to combat these bizarre and cosmic threats that are endangering the very existence of their reality. This title is wacky. There are no two ways about it. The stakes sound high and the characters certainly seem complex, but considering most of those you are introduced to are removed within the first issue, I am not sure where The Unexpected goes from here. …the issue as a whole felt like it was trying to be a lot of different things but failing all of them. The art is imaginative and characters appealing but the issue as a whole felt like it was trying to be a lot of different things but failing all of them. I’m not sure what tone The Unexpected was going for and maybe that is the point, so that it cannot be pinned down. Perhaps it will become clearer in the future. For now at least, this may be a fun read and something to make you think about, but don’t get too attached to this series too soon as it’s not very clear as to whether it will go to the heights expected of it as it is part of this new line of new age heroes.